It’s hard to not like the Mercedes-Benz SLS AMG GT. The all-aluminum coupe is fitted with a wonderful naturally aspirated 6.2-liter V8 delivering 583 horsepower and 479 pound-feet of torque. Not only does the burly combustion engine launch the two-seater to 60 miles per hour in less than four seconds, but it does so with one of the world’s greatest exhaust soundtracks as it roars, burbles and cackles down the road. But what happens when Mercedes-Benz takes away the V8 and its accompanying fire-burning song? Stripped of one of its most appealing assets, does the SLS lose its soul? Chris Harris recently had the opportunity to take the Mercedes-Benz SLS AMG Electric Drive for a track spin in Europe. Sans gasoline, but with four electric motors providing a combined 740 horsepower (737 pound-feet of torque), all-electric all-wheel drive coupe uses sophisticated torque vectoring and a multi-mode operating system to put oversteer – drifting! – back into the equation. Fun? You bet. See for yourself, below. 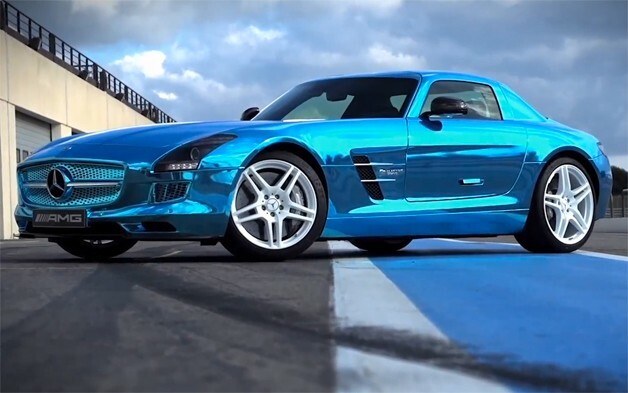 Test drive the Mercedes SLS AMG Electric Drive with Chris Harris originally appeared on Autoblog on Thu, 11 Apr 2013 20:01:00 EST. Please see our terms for use of feeds.